The Powerlock with V-Cutter S62-N features the SOG compound leverage system. What does this mean to you? Basically, the force of the hand pressure you exert will be doubled, allowing you to perform tasks with less strain on your hands. The handles have a pivoting cover that hides the area where the tools are stored, providing a much more comfortable gripping surface than other multi-tools. 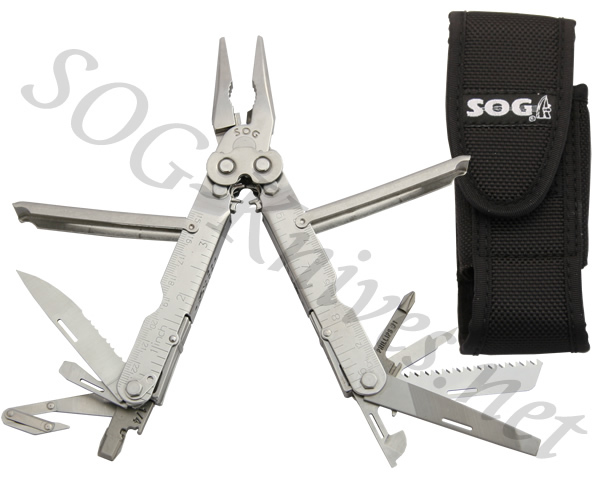 The components included with the SOG Powerlock with V-Cutter S62-N are pliers, grippers, wire cutters, crimpers, double tooth saw, partially serrated blade, V-cutter, bottle opener, medium screwdriver, ¼ inch driver, piano locks, lanyard ring, awl, Phillips screwdriver, can opener, small screwdriver, large screwdriver, and a three-sided file. The tool easily stores in a nylon case for convenient carrying. Own a SOG PowerLock w/ V-Cutter S62-N Nylon Sheath? Tell us how you like it! Got a question? Ask! Somebody will answer!